Fives patented FM Series chamber washer is an innovative solution to cleaning your powertrain, large engine and transmission components. Targeted halo cleaning and drying is encapsulated by see-through acrylic chamber that allows the operator to witness the entire process. Cleaning is achieved by moving finely filtered water solutions at elevated pressures across the workplace and allowing the water to impinge and drain several times through the cycle. The drying process utilizes high pressure air to shear the water from the part leaving a water and spot-free product. Flexible - Easily top loaded by gantry or robot as well as manually. Modular - Additional stations can be added at later date to accommodate increases in production. Portable - Skid mounted machine for ease of installation as well as relocation. 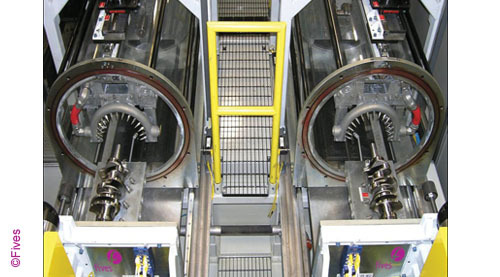 Performance - Cleaning and drying in single chamber allows for less time moving the work piece and more time cleaning. Visual Access - Easy to see all components inside wash chamber during the cleaning cycle. Accessibility - Accessibility to nozzles is done from outside the chamber making maintenance easier and faster. An innovation process and a brand for best-in-class products in terms of environmental performance.